Epic. 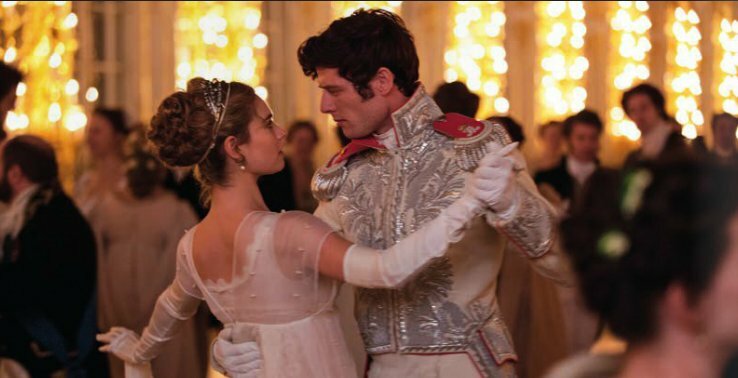 The first trailer for War and Peace features arresting wide screen images, beautifully shot. The actors look like they’re costumed perfectly—authentically—and the trailer hints that the series is filled with big, you might say epic, moments without giving too much away. The trailer for the upcoming six-part series starring Lily James as Natasha, Paul Dano as Pierre Bezukhov, James Norton as Prince Andrei Bolkonsky with Gillian Anderson, Jim Broadbent and Callum Turner does exactly what trailers are meant to do. It makes the audience—this one, anyway—want to see it. What do you say fellow fans of lush period dramas, does this one have you salivating? The series was written by Andrew Davies who has adapted a whole host of novels from the film script for Bridget Jones Diary to television series like the original British production of House of Cards plus a ton of classics, Little Dorrit, Northanger Abbey, Sense and Sensibility. The director Tom Harper, an unknown quantity to me, has several episodes of Peaky Blinders, The Scouting Book for Boys and The Woman in Black (2) to his name. He’s worked with cinematographer George Steel before, and visually anyway, the series looks gorgeous. To be honest, I think with an adaptation of a classic the success lies mostly in the script and the writer’s thorough knowledge of the author’s characters. Let’s hope Mr. Davies is a fast reader; he needs to have read the massive 1000 plus* page book several times! * somewhere between 1200 and 1500 pages depending on the edition.